Not since Scott and Charlene has there been a neighbourly match quite like Corina and Jo from Good for the Hood. Ok, so they aren’t a couple as such (although Jo routinely jokes she’d marry Corina in a heartbeat), but these two have been joined at the hip since 2017 through the love of their community. “We met on our street in Ryde, NSW in our trackies. After we shared the normal parenty stuff (that mums of boys under 3 inevitably share) we realised we both also had a passion for our street and the bushland behind our house,” Corina says (over a large coffee, still notably in trackies). Jo explains that is was actually the crap their kids kept finding in the bush that made them think maybe their area could do with a little clean up. So Jo and Corina devised a scheme to work with businesses and residents to reduce single use plastic. After 12 months of successful campaigning they decided it was time to take up the challenge to communities all over Australia, through their newfound social enterprise, Good for the Hood. And take up the challenge they have, with the help of the ABC’s War on Waste they have pegged up the large granny knickers, that is the wisdom they uncovered, onto the big, shiny clothesline of stuff, that is the internet. 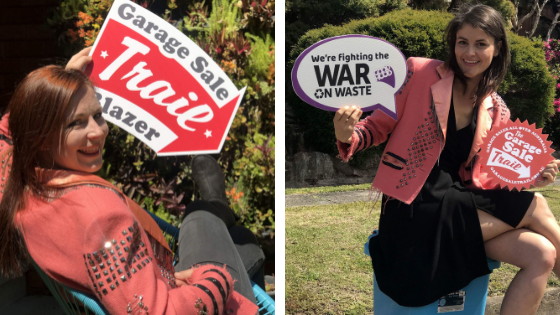 They launched a free toolkit for anyone with a passion for reducing waste, and they now want to share it with other aspiring waste crusaders (or clothes launderers) like you. So what’s the coolest group they’ve uncovered on their quest to put waste-reducing-wizards-of-awesome on the map? They have a few, “We love the legends at Trashless Takeaway in Tassie, Food is Free Laneway in Ballarat and of course we think the hundreds of Boomerang Bag communities all over Australia deserve a huge high five too,” Corina enthused. Basically they think (as do we!) anyone promoting reuse is worthy of a mention. The big question remained whether all those trackie pants were picked up from an op shop too, so of course we ask and yes, yes they were.